Stop what you’re doing. Oh wait, you’re reading my blog. Ok, carry on, because you MUST MAKE THIS RECIPE STAT! Seriously, for it’s optimal version it needs to marinate over night, so don’t waste any time! 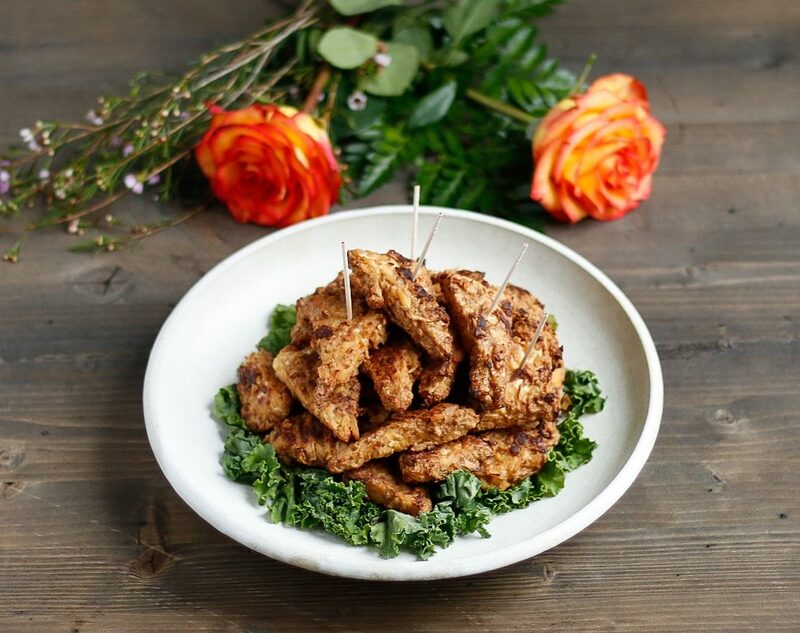 For this Roasted Peanut Tempeh, I took my all-time favorite (and most popular) chicken marinade and put it on something I can actually eat now that I’m vegan. I can’t believe this is my first post on Health Tastes Good using tempeh, since I eat it almost every day. Have you tried it yet? I’m obsessed. All weekend long, for some reason I had it in my mind that the Super Bowl was THIS coming Sunday, so I was working like a crazy person trying to get 5 appetizer posts made, shot, edited, and written to post each day this week. It wasn’t until I was watching the Patriots vs. Steelers Sunday night that I realized I still had two weeks until the big game *face palm*. 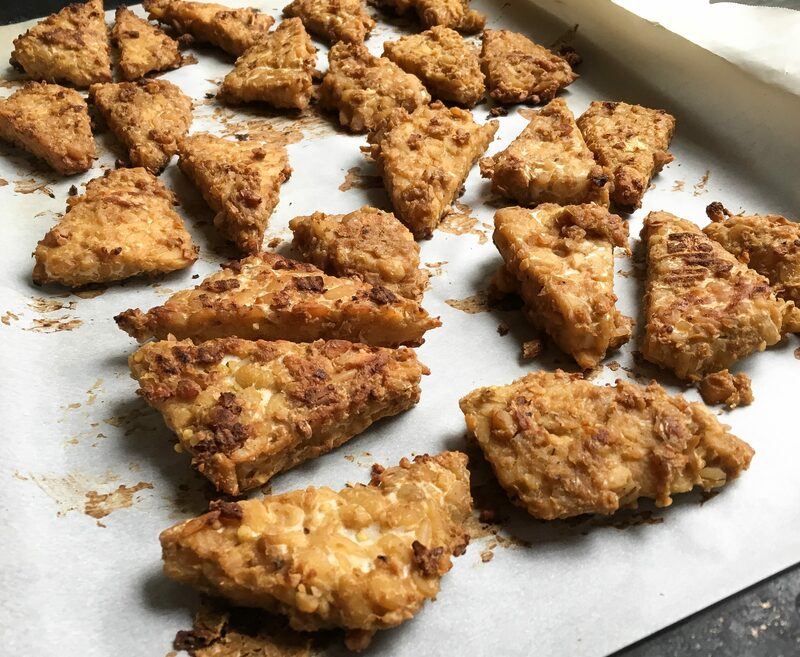 These Roasted Peanut Tempeh triangles were originally going to be shared as a part of my Superbowl round-up, but since today is NATIONAL PEANUT BUTTER DAY (aka best day ever…except for my birthday, that tops all) I’m bringing you these bites a little early. Looking for a dipping sauce? Krema is so ridiculously silky, you can just dip the tempeh straight in! Best part? 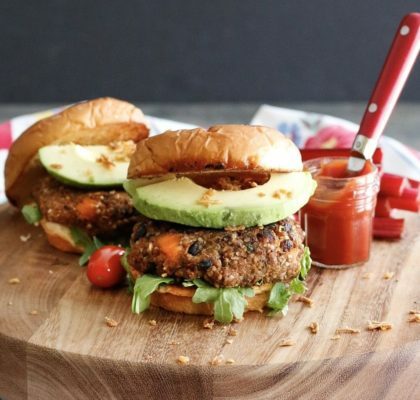 The only ingredient is PEANUTS! For both of those reasons, this is my favorite peanut butter! I tried this recipe months ago, but couldn’t get the flavor I wanted since the sauce just seemed to coat the outside edge, without really penetrating the entire piece. It wasn’t until a couple weeks ago, Minimalist Baker posted her version of peanut tempeh, and it was in her preparation method I had an a-ha! moment. Before marinating, she boiled the tempeh- she said to remove to the bitterness, but in my opinion, it softened the soybeans by making them more porous, so the peanut sauce was able to flavor the tempeh better. I was originally making this Roasted Peanut Tempeh for a summer recipe (shhh I’m keeping it a secret for another couple months) so in the meantime I’ve been racking my brain for something to put this in. I’m thinking either a Thai Salad or Wrap, but is that cliche? Anyway, I wasn’t going to post until I created a full meal, but then I thought, Ellen, you just snack on these triangles, why wouldn’t anyone else? So voila! A crispy, chewy, sweet and salty bite, perfect for snacks throughout the week, or for Super Bowl Sunday next weekend! 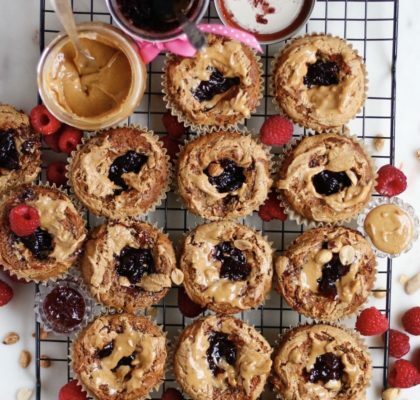 This snack will keep you full from all the protein, and satiate both sweet and savory cravings. I also think it tastes great as a scoop, or maybe more of a “shuttle” for my Mango Salsa, but that may just be my palate. (Mango Salsa recipe coming next week!). 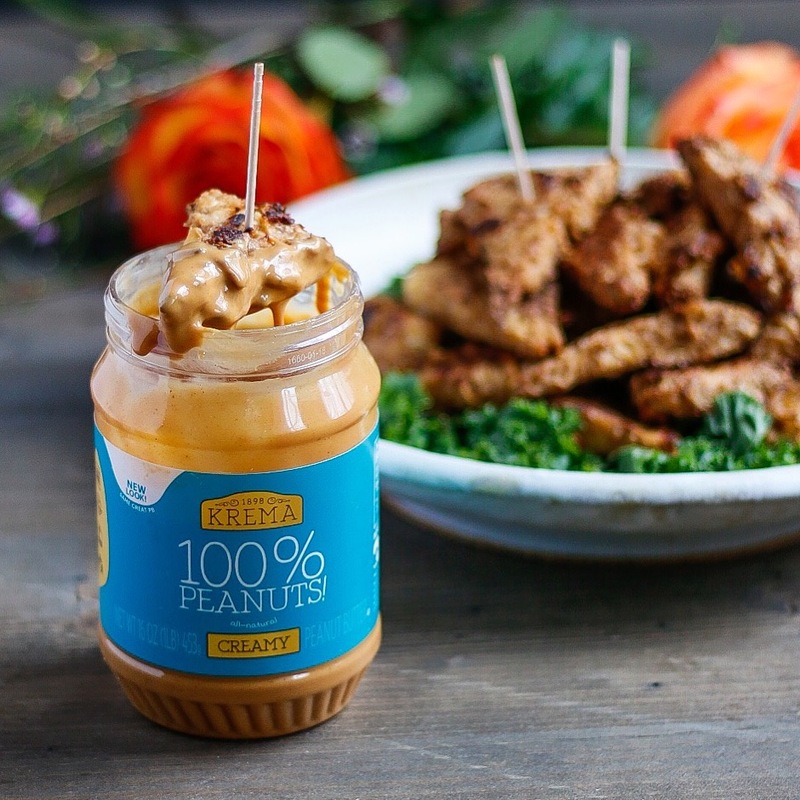 If you’re a tempeh skeptic, this Roasted Peanut Tempeh is the perfect recipe to finally try it in! 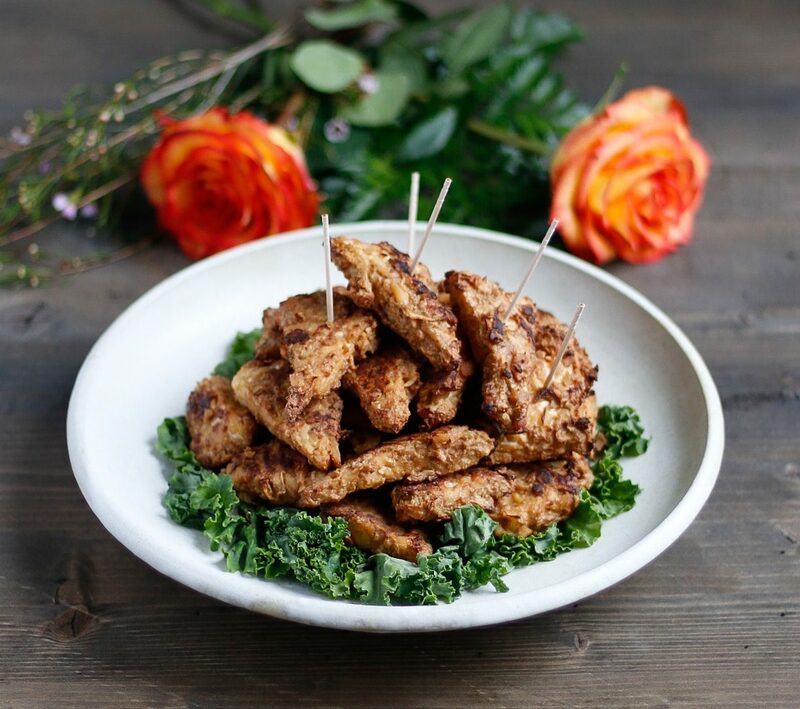 Tempeh has become one of the top protein sources in my diet (only second to my favorite MRM Veggie Protein*) not only for it’s promotion of muscle building and recovery, but because of the way it improves the health of my gut. Tempeh is fermented soybeans, and fermented foods provide you with probiotics. Probiotics help regulate digestion, boost the immune system, and support memory and cognition. They basically have repercussions throughout your entire body, since they directly impact the gut, and the gut is your “second brain”. A regular probiotic is something I recommend everyone take. 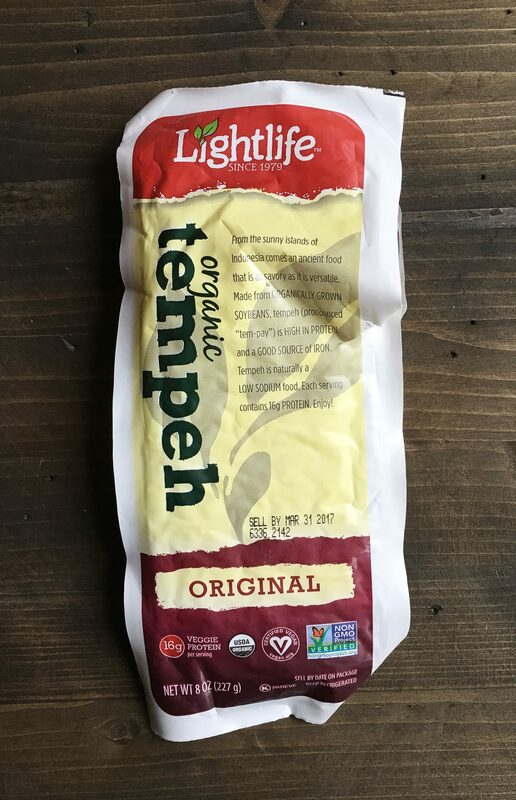 When it comes to buying tempeh, I always use Lightlife brand, because it’s all I can typically find in grocery stores. My only complaint about this brand is how hard and dense it is. When I was in Montreal this fall, the tempeh in their market and in all the restaurants was so soft and almost spongy. Boiling the tempeh before marinating helps with this a bit, but it’s still not the same as I had in Canada. Feel free to use any brand you like, this is just what my store always has. Alrighty then, the sooner you get cooking, the sooner you can get snackin’! Below is what you need. Feel free to ask me any questions or post any comments below! 1) Remove tempeh from plastic, and place in a large sauté pan, with enough water to float the tempeh. Bring the water to a low boil over medium-high heat, and then let the tempeh steam for 10-15 minutes, flipping halfway through. Remove from the water, pat dry, and then slice each brick into 16 triangles. I do this by slicing the rectangle into 4- then slice each of those diagonally into 2 triangles- and slicing each triangle in half horizontally, so each piece is about 1/3 inch thick. 2) While the tempeh is steaming, grind the onions and garlic in a food processor until very fine. Pour into a large mixing bowl with the remaining ingredients, stirring to mix well. Add the tempeh triangles, tossing to coat, then cover and refrigerate overnight (8-24 hours- the longer, the better). 3) When ready to cook, preheat the oven to 375 F. Spread the tempeh out evenly on to parchment lined baking sheets, trying not to let the pieces touch. Roast 20-30 minutes, until crispy. I like to flip my pieces after 15-20 minutes, but that’s totally optional. 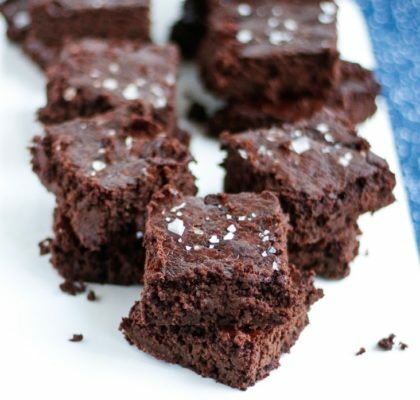 Serve sprinkled with course sea salt, or drizzled with a bit more peanut butter. Enjoy as a snack, appetizer, or as part of a regular meal! *40% off when you use the code ELLEN through the clickable link above! **You can fit 3 packages in this marinade, but 2 is also fine- it will just be extra saucy. ***I typically leave this out of the marinade, and then just grind sea salt over my pieces before eating. The original recipe called for 1 tsp, but I find that to be too much for my taste since the liquid aminos are salty too. However, salt does act as a tenderizer, so it’s good to have some. I’ll leave this up to your tastebuds!